A brief tour around Madeley, the areas and a little of the history! Barhill lies on the western side of Madeley and is separated from it by the West Coast Mainline. It consists of several neat townhouses which run along the northern side of the road. In addition there are spotted about, one or two quaint cottages. The picture shown is taken from the railway bridge looking towards Onneley. Over the wall on the right is the now disused reservoir that served the railway water troughs in the steam days. A further use for this water, was to supply Crewe railway works via two large mains pipes, which ran northward alongside the rails. 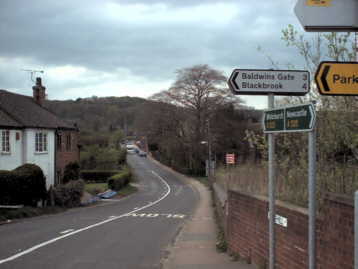 The sign for Baldwins Gate and Blackbrook points south along Manor Road. This photograph was taken the day before resurfacing and widen of the road at the top of Barhill Road. 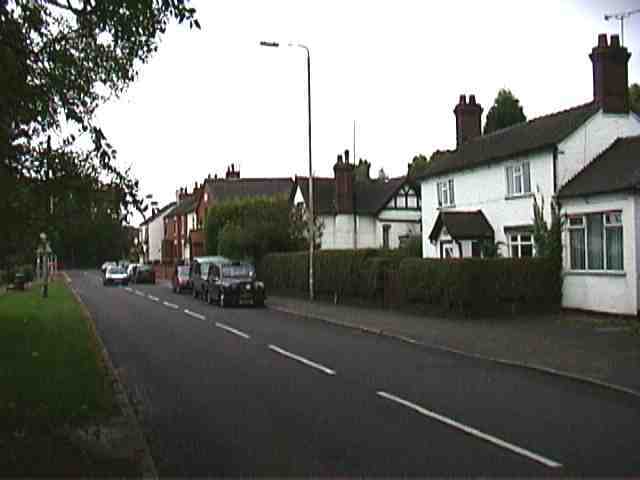 Little Madeley is the area from just east of the M6 motorway bridge over the A525 to Parkside close to where College Gardens ends. The M6 built in the early 1960’s cuts through the village at this point. The main A525 has been lowered to accommodate the flyover above. If you look closely when passing, you will note where the land has been cut away to allow passage. Indeed, in stormy weather there is a tendency towards flooding in this area. 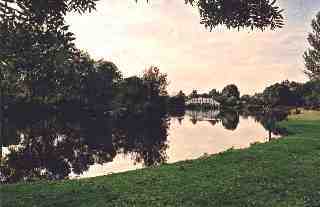 After the Motorway bridge is the area where the Manor Pool can be found. The photo is a view from the weirs at the Betley road looking towards Newcastle Road, which is beyond the white building in the distance. Shown here is a picture kindly donated by Hector Simmonds. It was taken in the summer of 2000 by Madeley Pool. Looking this time, along Poolside towards the Old Hall. Compare the two photographs above with those shown in “Keele, Madeley and Whitmore, in old picture postcards. Barbara and Dennis Morris, Anthony and Joy Priestley, Roger Simmons and Edward Watkin. Brampton Publications 1990. (Photo – © of Kevin J. Clarke) Mill (or Madeley) Pool. One of the landmark buildings of the village is of course the former Mill. It is a building that gives the whole pool area its character. It would have been a great asset lost to the community if it had been torn down in the late 1980’s as was the intention.Compare how it looks today with the photograph of the same building taken in 1982 in its derelict condition. Windows have been added, the hoist door in the front gable has been bricked up and the whole building looks resplendent in it’s white paintwork. When in operation, the Mill pool was guarded by railings. Again Poolside towards Moss Lane. The Chapel and Cyber Cafe can just be seen above the bush left of centre. This plate was used to lay out the wheels when fitting the outer steel bands. 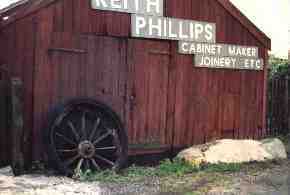 The Picture on the right shows the joinery shop which is situated adjacent to the railway line. For many years, a chapel used to stand in the small triangle between the railway, Barhill Road and Moss Lane. Unfortunately, vibration from passing rail traffic made the building unsafe and eventually it had to be pulled down. On the opposite side of the track from the location of the former chapel, can be found the trough reservoir. When steam locomotives were the main source of traction on the railways, long distance runs could not be achieved without frequent stops for taking on water for the boilers. To alleviate this problem, wooden troughs of anything up to two miles long were constructed on level ground between the rails. This is the case with Madeley, which had its own set along this stretch of railway. When travelling over these constructions, the fireman would manually lower a scoop into the water from the engines tender. Forward velocity from the train would then force water into the scoop, up and into the water tanks aboard the tender. Many a disaster has befallen tardy firemen in returning the scoop before the end of the trough is reached. Station Road accommodated the main line railway station with its own railway hotel. Although no longer a hotel the building still remains as a private dwelling like so many other railway buildings. (see Keele Station) Sections of the hotel were removed to give it the size it is today. 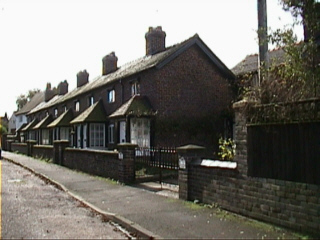 Alms houses for the poor of the area, were built at the opposite end of Station Road by the junction of Barhill Road. These buildings are still in existence, having great character with a pleasant view across fields to the south east and of the church. Towards the Old Hall across the River lea Bridge. As you enter Madeley Heath from the east from Newcastle-under-Lyme on the A525, you pass under a railway bridge on the outskirts of Keele. This is the spur line from Stoke-on-Trent in the Potteries. Originally constructed by The North Staffordshire Railway under the auspices of Robert Stevenson it used to run through Newcastle-under-Lyme into Silverdale and onto and over the former London and North Western Railway West Coast Main Line. In the Beeching period the stations along this line were closed and the track removed, leaving a small section to serve the colliery at Silverdale two miles away. However, with the closure of the colliery in 1998, the line has now fallen out of use. Prior to the bridge, on the right is Station Drive, a dirt track, which used to lead to Keele Station. See Picture The station masters house can still be found at the top of this dirt track, although now it is a private dwelling. In 1985 there were still both platforms at Keele but no station buildings. 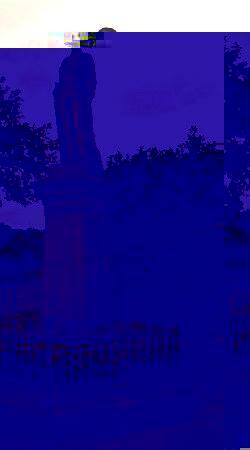 Two hundred metres further along there are two large pillars on either side of the road. These are the former rail bridge supports for the mineral branch line serving the coal pits at Leycett and Finney Green. Indeed, if you take a close look in the fields at Leycett from the Leycett Lane, you can still make out the raised embankments from the Audley branch line, through Redhill, Butters Green and Bignall End. 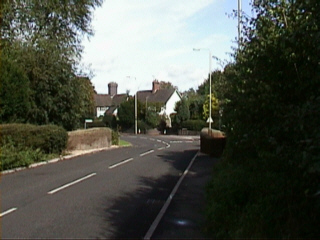 To the north of Madeley Heath is Finney Green. In May of 1970 this small community became the focus of the whole country, when the ‘Hollywood Rock Festival‘ was held there. The band Mungo Jerry performed at the festival amongst many others. 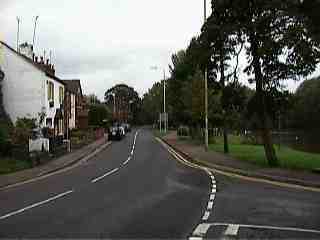 Madeley Heath also continues from the junction next to the war memorial (Photo. © Andrew T. Finney) along the A531 and on towards the second M6 flyover. It is between these two points that Swan Bank can be found, with the Old Swan public house as the main focal point next to the main road. Smaller parts within these areas include Swan Bank on the A531 past the junction at the war memorial and the general area encompassing College Gardens estate and Little Madeley. 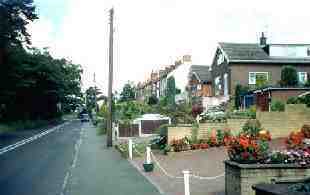 Within Little Madeley are the majority of the amenities including shops and the Madeley Pool. Swan Bank can be seen here on the right looking towards Crewe and Nantwich. Directly behind is The Old Swan public house. 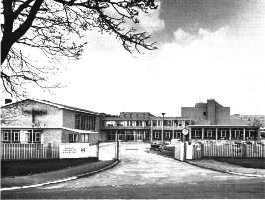 for a time, was the base for Madeley Teachers Training College, now it is the location of the College Gardens estate. The only visible remnants of the former college today are the railings next to the bus stop and the former caretakers house, next to the service lane by Beck Road.